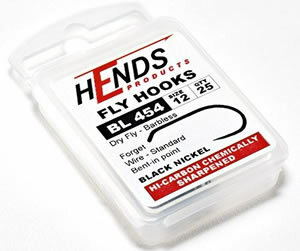 I recently discovered Hends barbless dry fly hooks after buying a few packs from the Competitive Angler from PA. Personally I really like using barbless hooks for fly fishing for trout but I also want a wider gap especially in the smaller sizes. 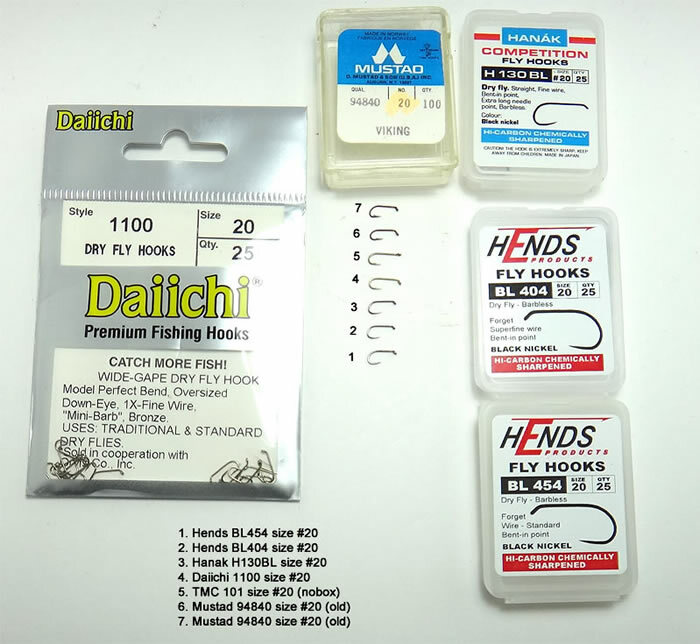 I have tried several competition hooks incuding Hends, Hanak and Dohiku. Actually all three competition hook brands are very similar in size, hook shank length, type of hook point and the hook eye profile. Quality wise I feel Hends to be slightly better and their price per pack of 25 hooks is around $3.50 to $4.00 less than the other two. This can add up fast if you go through a lot of hooks like I do each season. Hends Products (http://hendsproducts.cz/) is out of the Czech Republic and is distributed locally in the USA. They offer a variety of barbless trout hooks, including dry fly, wet fly, pupa/scud/shrimp, nymph, streamer and jig hooks. All the hooks I have seens from Hends are hi-carbon chemically sharpened and many have a slightly bent-in point. I doubt the trout care but I do like the look of these hooks better than the standard hooks from Mustad, TMC or Daiichi. The wider hook gap on the Hends smaller size hooks I find really helps increase my hook-ups with feeding trout. Also, I made a simple hook comparison chart using some different hook brands I have in size #20 dry fly hooks. As most fly tyers already know there are no universal hook standards so hook lengths and gaps do vary from brand to brand which came make it difficult when ordering a new hook brand for the first time over the Internet. Hopefull the photo below will help. Note: I added a couple of my really old Mustad 94840 for a comparison. It helps show how much hooks have evolved in the past 30-40 years.